In 2012, when everyone assumed that no one wanted a smartwatch, the original Pebble became the poster-child for the crowdfunding site Kickstarter when it raised just over $10 million from excited backers. Five years later, Pebble is no more, its intellectual assets are now owned by Fitbit, and the company’s CEO is returning to Kickstarter with a new product that promises to protect and charge your pricey AirPods headphones. The PodCase charges over USB-C. 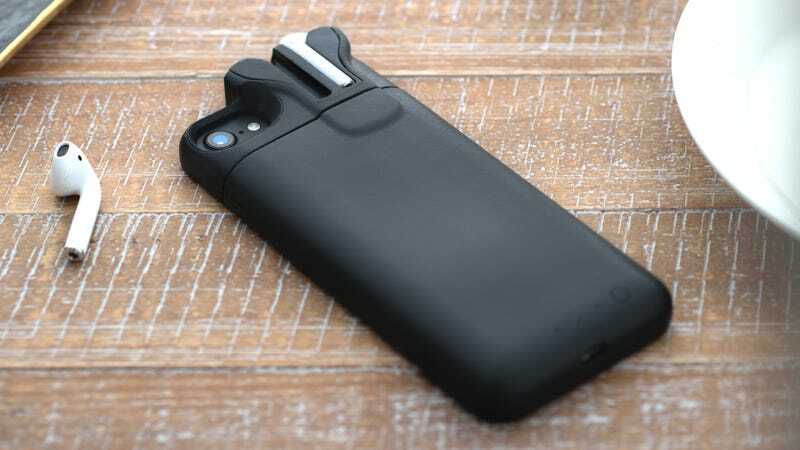 The PodCase is reminiscent of the bulbous smartphone battery cases that companies like Mophie sell. Inside it you’ll find a 2,500 mAh battery pack that can completely recharge a dead iPhone 7 (1,960 mAh) or almost double the life of the iPhone 7 Plus (2,900 mAh). It’s also charged through a USB-C port, so you can use the same charging cables your fancy new MacBook does. What sets the PodCase apart from other battery cases is a large protrusion, next to the iPhone’s rear camera, where you can securely dock and charge your AirPods headphones. Strong rare-earth magnets keep the AirPods securely docked to the PodCase, even when your phone is stashed in your pocket. The charging case that Apple includes with the AirPods has enough power to recharge the headphones around five times, but the PodCase bumps that up to somewhere close to 40 full charges—but that’s assuming your smartphone hasn’t already started depleting the case’s battery. The PodCase also makes it easier to quickly access your AirPods, as Apple’s charging solution includes a lid you have to first pop open, and it allows you to charge your iPhone, backup battery, and headphones, all using just a single cable. The tradeoff? You’re completely negating all the work Apple put into making the iPhone a thin and sleek device. This is an accessory for people who prioritize battery life over everything else. With the PodCase in your pocket, your AirPods are supposed to be easier to access. The earliest backers of the PodCase can pre-order one via Kickstarter for $80, with delivery expected in February of next year. If you’d rather hold off until product actually starts shipping, the retail version of the PodCase will sell for $100. As with any crowdfunded product, there’s always some risk involved. On a certain level, crowdfunding sites like Indiegogo and Kickstarter are designed to pass the risks of launching a new product on to the consumer, but it’s not necessarily a success once a product is delivered. The team behind the PodCase includes Eric Migicovsky, the former CEO and founder of Pebble, as well as Steve Johns, who was the company’s founding industrial designer. The Pebble is considered one of Kickstarter’s biggest success stories, but after Fitbit’s acquisition of the company’s assets, Pebble owners were left with a smartwatch lacking a warranty or any tech support should their hardware fail. But hardware does fail; it’s inevitable. And knowing that the $100 smartphone case you purchased will still be repairable in a few years is a valid concern. The PodCase might be an improvement on Apple’s solution for charging and protecting your AirPods, but if something goes wrong with Apple’s hardware in a few years, you can at least be confident you can get it fixed.